I can hardly put into words what Manu Ginobili means to me. Without his knowledge, the guy has influenced my life in so many ways. It’s very likely that, had Manu not existed, I’d still be pursuing a career in sports journalism. Having the chance to cover people like him has made me much more comfortable with this decision. The memory, however fuzzy it is, remains. I remember myself ten years ago, lying to my dad. I promised that I would go to sleep early, but instead I stayed up late to watch the NBA Finals. I couldn’t tell what it was, but something had caught my eye. As the series went on, my lying habits continued, and somehow I convinced my dad (a rare feat) to join me. We watched the final three games together, celebrating Manu´s second championship. While my passion for sports journalism and the NBA arrived years later, my personal connection with Ginobili was forged during those nights in June 2005. During these last 10 years, I´ve followed him closely and seen how he carries himself, both on and off the court. That´s what truly makes him a figure of admiration. Basically, this whole thing can be summarized in three words: I am selfish. I have no problem admitting it. 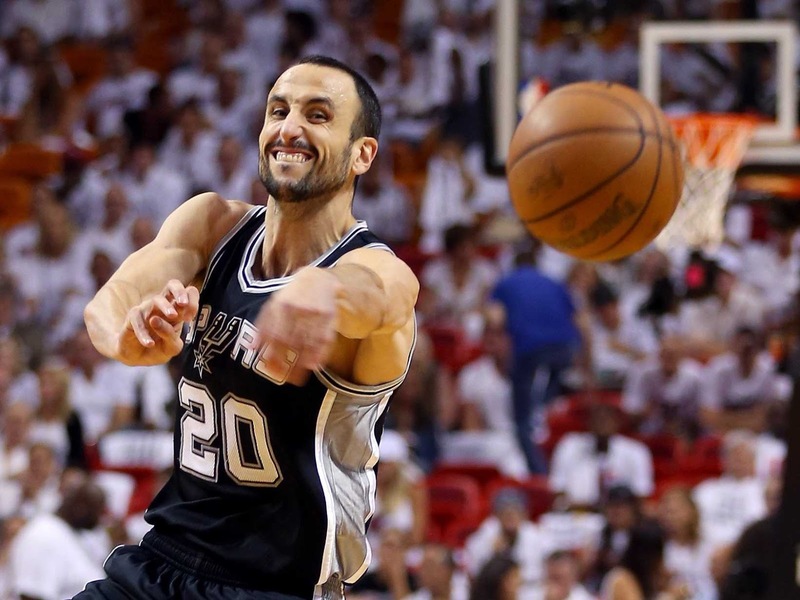 When it comes to Emanuel David Ginobili, I do not care about anything but watching him play. I know that he’s probably tired, that he doesn’t have much left in the tank and that he wants to spend time with his family. Forgive me, Many. Please forgive me, Dante, Nicola and Luca. I just want to keep watching Manu. 13 seasons in the best basketball league in the world. Four rings (one of them, precisely in 2005, should’ve come with a Finals MVP trophy attached to it). Two-time All-Star. Sixth Man of the Year (in 2008). Two 3rd Team All-NBA nods. 28,627 minutes played (that’s including Playoff stats, as he likes to do). How could anyone ask him for more? How many more dunks like this one, that made me leap out of my couch and start yelling like a madman, can he manage? How many more clutch moments, down by two with 30 seconds left, against an opponent who seemed invincible to the Spurs, does he have left in his bag? How many more buzzer beaters, say, on a December night in 2010 (which I still remember like it was yesterday because I woke up the whole block) will he even attempt? How many more impossible, unthinkable shots, after playing awful during almost an entire game, can he hit? Logic says that few, if any. But here´s the key: I do not care. I do not need all these highlights to enjoy Manu. I only need him, trotting slowly with the ball in his hands. I need to see him signal to a big that he wants a screen. I need to see him whip a bullet pass directly to the chest of a teammate. I need to see him throw one between-the-legs to Duncan, or just a quick backdoor to Parker. Classic Manu. I need to see myself watching him (if that makes any sense), knowing wholeheartedly that just having Ginobili on the floor is enough, but at the same time hoping for that one play that’ll make me start screaming again. Ahhhh, yes, don’t forget what I said before: When it comes to Manu, I am selfish. A stinking, selfish man.